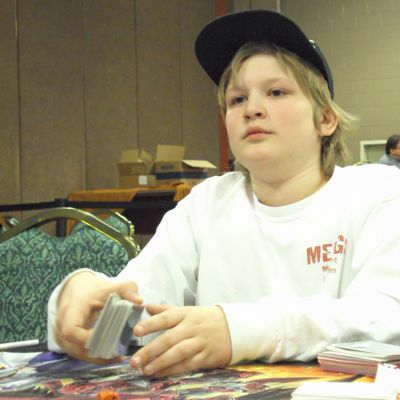 Jackson Baum, age 12, is playing a Destiny Hero / Absolute Zero Deck in this side event playoff. 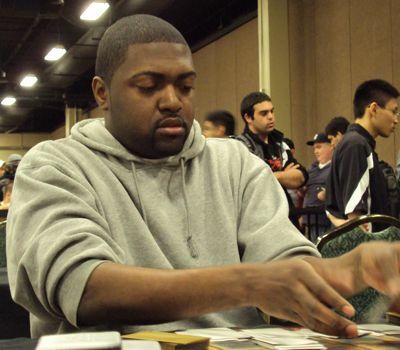 His opponent is Lamar Curtis, age 26, who came here from Brooklyn to Duel with his Lightsworn Deck. The winner here would receive a “Dark End Dragon” prize card, so both Duelists were about to give it their all! Baum won the dice roll and opened up with “Torrential Tribute,” “Mirror Force,” “Bottomless Trap Hole,” “Gorz the Emissary of Darkness,” “Deep Sea Diva,” and “Spined Gillman.” He Set “Bottomless Trap Hole” and ended his turn. Curtis activated “Charge of the Light Brigade” to send “Lumina, Lightsworn Summoner,” “Celestia, Lightsworn Angel,” and “Archlord Kristya” from the top of his Deck to his Graveyard. He searched his Deck for Lumina with the effect of Charge and added it to his hand. Then he Normal Summoned Lumina and discarded “Garoth, Lightsworn Warrior” to Special Summon Garoth back to the field with Lumina’s effect. Baum flipped “Bottomless Trap Hole” to remove it from play. Lumina attacked directly and Baum Special Summoned Gorz to the field in Attack Position along with a token. Curtis Set a back row card and then sent “Necro Gardna,” Lumina, and a Spell to his Graveyard in the End Phase. Baum drew “Miracle Fusion” next turn and then switched his Token to Defense Position. He attacked Lumina with Gorz, but was blocked by “Necro Gardna.” Baum Set “Torrential Tribute” and “Mirror Force” before ending his turn. Curtis Special Summoned another copy of Lumina to the field by discarding “Necro Gardna” with his Lumina’s effect. Then he discarded another card to Special Summon Garoth. Baum flipped “Torrential Tribute,” but Curtis chained “My Body as a Shield” to negate it. When Curtis attacked Baum with Garoth, Baum flipped “Mirror Force” to destroy both copies of Lumina and Curtis’s Garoth! Baum Summoned “Spined Gillman” next turn and attacked with all of his monsters. On his next turn, Curtis Summoned “Aurkus, Lightsworn Druid” and attacked Baum’s “Emissary of Darkness Token” to destroy it. Baum activated “Destiny Draw” next turn to discard “Destiny Hero – Malicious” and draw 2 cards from his Deck. Then he Summoned “Deep Sea Diva” to Special Summon another copy of Diva his Deck. Next, he removed a “Destiny Hero – Malicious” to Special Summon one more. He Tuned “Deep Sea Diva” to “Spined Gillman” to Synchro Summon “Sea Dragon Gishilnodon.” Then he Tuned Malicious to “Deep Sea Diva” to Special Summon “Stardust Dragon.” Next, he used Miracle by removing a Hero and a WATER monster from his Graveyard to Special Summon “Elemental Hero Absolute Zero.” Absolute Zero attacked Aurkus first and Curtis blocked the attack with “Necro Gardna.” Then Gishilnodon attacked and Curtis dropped “Honest” from his hand to boost Aurkus. On his next turn, Curtis was staring down a “Stardust Dragon” and “Elemental Hero Absolute Zero.” He conceded, knowing Baum would finish him off on the following turn. Both players Side Decked and Curtis chose to go first. He Set a card to each zone and then passed to Baum. Baum opened up by activating “Allure of Darkness” and removing “Dark Armed Dragon” from his hand. Then he Summoned Gale and activated “Mind Control” to take control of “Necro Gardna.” He Tuned them together to try to Synchro Summon “Goyo Guardian” but Curtis flipped “Royal Oppression” to negate its Summon at the cost of 800 Life Points. Baum Set 2 cards to his back row and ended his turn. Curtis activated “Solar Recharge” next turn to draw 2 cards from his Deck and send “Judgment Dragon” and “Honest” from the top of his Deck to his Graveyard. Then he played “Heavy Storm” to destroy his own “Royal Oppression” and Baum’s “Bottomless Trap Hole” and “Light-Imprisoning Mirror.” Then he Summoned Garoth and attacked. Baum Set “Plaguespreader Zombie” on his next turn and passed back to Curtis, who attacked it with Garoth and destroyed it. Baum drew and Set “Torrential Tribute” next turn and Curtis attacked directly with Garoth. Baum took the damage and was up again. He drew “Mirror Force” and Set it, before passing back to Curtis. Curtis attacked with Garoth directly again on his next turn and Baum took the damage. Then he Set another card to his back row and ended his turn. Baum drew “Reinforcement of the Army” next turn and activated it to grab Stratos from his Deck. He Summoned it to the field and activated its effect to search for “Destiny Hero – Malicious.” He discarded Malicious for “Destiny Draw” and drew 2 cards, and Curtis chained “D.D. Crow” to remove Baum’s Malicious from the game. On Curtis’s next turn, he flipped Ryko face-up to destroy Baum’s Set “Bottomless Trap Hole” and send the top 3 cards of his Deck to his Graveyard. Then he activated “Beckoning Light” to discard his hand and return 2 copies of “Honest” and a Celestia to his hand. Then he Tributed Ryko for Celestia, targeted Baum’s 2 Set cards with her effect by sending the Top 4 cards of his Deck to his Graveyard, and Baum chained “Torrential Tribute.” But Curtis chained “Solemn Judgment” to negate it! “Mirror Force” was destroyed by Celestia’s effect. Curtis attacked over Stratos with Celestia and dropped 2 copies of “Honest” from his hand to boost it by 3600 ATK, ending the Duel. Baum chose to go first in Duel 3. The winner of this final Duel will receive the prized “Dark End Dragon” card. Baum opened up with “Destiny Hero – Malicious,” “Plaguespreader Zombie,” “Blackwing – Gale the Whirlwind,” “Caius the Shadow Monarch,” “Heavy Storm,” and “Future Fusion.” He started things off by activating “Future Fusion” and revealing “Elemental Hero Absolute Zero” from his Extra Deck to send “Treeborn Frog” and “Destiny Hero – Diamond Dude” to his Graveyard. Then he Set a monster and ended his turn. Curtis activated “Solar Recharge” next turn by discarding a Lightsworn monster. He drew 2 cards, and then sent the top 2 cards of his Deck to his Graveyard. Then he Summoned Lumina and activated her effect by discarding “Necro Gardna” to Special Summon Wulf. Next, he attacked Baum’s Set “Plaguespreader Zombie” and destroyed it before attacking with his other monster. He Set a card to his back row and then sent 3 cards from the top of his Deck to his Graveyard in the End Phase. Baum drew “Trap Dustshoot” next turn. He Set it face-down and then put a card from his hand on top of his Deck to Special Summon “Plaguespreader Zombie.” He Tributed it for “Caius the Shadow Monarch” to remove Lumina from the game with the effect of Caius. Caius attacked, and Curtis flipped “Mirror Force” to destroy it! Baum flipped “Trap Dustshoot” in Curtis’s Draw Phase, revealing Lyla, 2 copies of Lumina, and “Heavy Storm” in Curtis’s hand. Baum sent 1 copy of Lumina back to Curtis’s Deck. Then Curtis activated “Heavy Storm” to get rid of Baum’s “Future Fusion,” Summoned Lumina, and discarded a card from his hand to activate Lumina’s effect and Special Summon a Wulf from his Graveyard. The monsters attacked, and Curtis sent 3 cards to his Graveyard in the End Phase. Baum Summoned “Blackwing – Gale the Whirlwind” next turn and halved the stats of Wulf with Gale’s effect. Then he attacked Wulf with Gale, but was blocked by Curtis’s “Necro Gardna.” Curtis Summoned Lyla next turn and attacked Gale with it. Then Wulf attacked a “Treeborn Frog” Baum had Special Summoned from his Graveyard on his last turn, and Lumina attacked directly. Baum drew Gorz next turn and passed to Curtis. Curtis discarded “Necro Gardna” to activate the effect of Lumina, and Special Summoned another copy of Lumina from his Graveyard. Then he attacked with Lumina for 1000 Damage and Baum Special Summoned Gorz in Defense Position along with a Token. Curtis destroyed the Token in battle and Set a card to his back row. He ended his turn, sending 9 cards to his Graveyard. Baum drew “Threatening Roar” next turn! He asked Curtis how many cards were in his Deck. There were only 7! With 2 copies of Lumina and a Lyla on the field, it looked like Curtis was going to Deck out! Baum Set the “Threatening Roar” and ended his turn. Baum activated “Threatening Roar” on Curtis’s turn and Curtis chained his one back row, “Solemn Judgment,” to negate it! Then he attacked with his swarm of monsters, using “Honest” to get over Gorz and win the Duel! 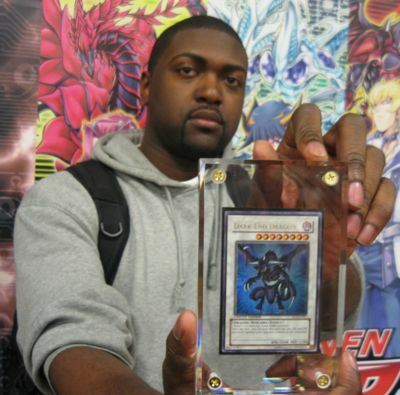 In a close 2-1 victory, Lamar Curtis earns a “Dark End Dragon” by beating Jackson Baum’s Destiny Hero / Absolute Zero Deck! See what our panel of experts had to say after the Duel. Baum had some tough luck in Duel 3, after his “Threatening Roar” was negated by “Solemn Judgment” when it looked like it was about to win him the Match. Despite his loss, Baum showed a lot of potential. He knew when to play conservatively and when to commit cards to the field. As he gains more experience, he’s sure to become even better.